Rigging gear on set can be a hassle. Clamps, screws, stands, etc. all can get in the way of speed and creativity. Dinkum Systems has a great assortment of articulating mounts and shades for film and audio professionals. We had a chance to work with three of them including the ActionPod, FlexiMount and FlareDinkum. The ActionPod is perfect for small cameras, monitors and other accessories that have a 1/4″-20 mount. Easily place the camera or accessory anywhere you need it. The clamp is very strong and can hold to most surfaces, whether flat or round. The arm is strong and can hold a good deal of weight. Once you adjust your position, you can be confident that it won’t move till you want it to. Moving it still requires two hands which isn’t too bad. I would have loved to have been able to move my monitor with just one hand while operating camera but chances are you won’t get the right position you want till you bring in your second hand. The FlexiMount is just a larger version of the ActionPod. The clamp is bigger and the arm is longer and it has the option to mount either 1/4″-20 or 3/8″. This allows accessories like microphones to mount to the FlexiMount. This could free you up from needing a boom operator for certain shoots. The FlareDinkum is a really handy French Flag that can help block lens flares quickly and easily. Whether you have a mattebox or not, the FlareDinkum is just plain faster to setup and use. Plus it has more adjustability than a traditional mattebox. Only downside of the FlareDinkum is the inability to block multiple flares as you could with a mattebox with top and side flags. One unique feature of the Dinkums is the ability to add or remove length to the arms. With some gusto, you can pop the sections apart and order extra lengths. The price is a little high for what they are, though the build quality does validate that price somewhat. The truth is, they are still very affordable and if you use them often, you’ll make up your investment on the first shoot. 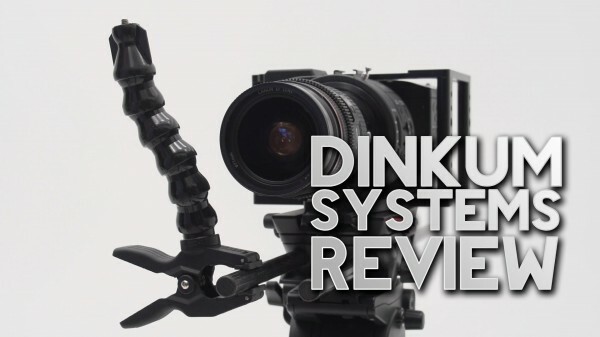 Watch our full video review below and find our more about Dinkum Systems here.